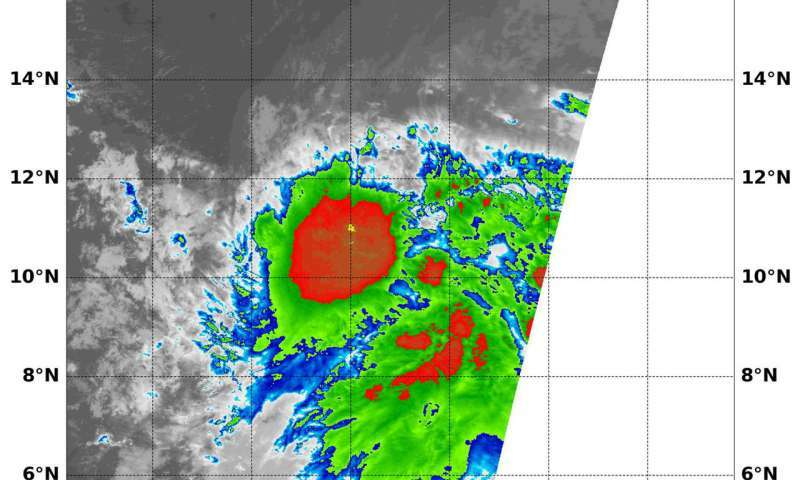 The Eastern Pacific Ocean's Tropical Depression 9E formed on July 26 and by July 27 the depression had dissipated over 1,200 miles from Hilo, Hawaii. NASA's Terra satellite captured a look at the storm at its peak. On July 26 at 4:05 p.m. EDT (2005 UTC) when Tropical Depression 9E was at its strongest, NASA's Terra satellite passed overhead and the MODIS instrument or Moderate Resolution Imaging Spectroradiometer analyzed the storm in infrared light. Infrared data shows cloud top temperatures, and storms surrounding 9E's center were as cold as minus 70 degrees Fahrenheit (minus 56.6. degrees Celsius). Strong storms also appeared in a band of thunderstorms wrapping into the center from the southeast. Those indicate strong storms with the potential for heavy rainfall. By 11 a.m. EDT (1500 UTC), 9E had degenerated into a remnant low pressure system. The remnants of 9E were located near latitude 10.6 degrees north and longitude 138.8 degrees west. That's about 1,255 miles (2,015 km) east-southeast of Hilo, Hawaii. The remnants are moving toward the west near 13 mph (20 kph). Maximum sustained winds are near 30 mph (45 kph) with higher gusts. 9E is now an elongated area of low pressure, or a trough and it is expected to move into the Central Pacific basin later in the day on July 27.